This manufacturing method can help create flexible wearable electronics #Wearables « Adafruit Industries – Makers, hackers, artists, designers and engineers! Wearable electronics are useful in measuring vitals and activity, but usually aren’t fit to flex with the body. Harvard researchers have come up with a flexible solution using 3D printing. The human skin flexes and stretches to match how our bodies move. Anything worn tight on the skin needs to be made of a flexible material that can also move with the body, like spandex. Incorporating rigid electrical components on or within materials similar to spandex has been challenging in the past because the electronics are unable to flex and creates stress between hard and soft elements. Wyss Institute for Biologically Inspired Engineering at Harvard University researchers have created an additive manufacturing technique for soft electronics called hybrid 3D printing. The method involves combining soft, electrically conductive inks and matrix materials with rigid electronic parts and putting them into a stretchable device. “With this technique, we can print the electronic sensor directly onto the material, digitally pick-and-place electronic components and print the conductive interconnects that complete the electronic circuitry required to ‘read’ the sensor’s data signal in one fell swoop,” Alex Valentine, the study’s first author and former staff engineer at the Wyss Institute, said in a press release. The conductive ink is made from thermoplastic polyurethane (TPU). The device uses pure TPU and silver-TPU inks to create a soft substrate with conductive electrodes. During the 3D printing process, silver flakes in the ink align themselves in the printing direction s the flat, plate-like sides are layered on top of each other. The layering improves conductivity with the printed electrodes. 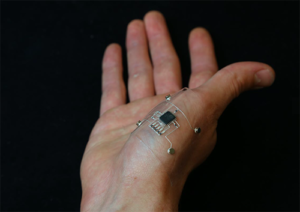 “Because the ink and substrate are 3D-printed, we have complete control over where the conductive features are patterned, and can design circuits to create soft electronic devices of nearly every size and shape,” Will Boley, co-author on the study, said. When the material is stretched, soft sensors with conductive materials experience changes in their conductivity. The soft sensors are combined with programmable microcontroller chips that process the data from movements and a readout device that is able to communicate that data in a way that users can understand it. The researchers used a combination of printed soft sensors and a digital pick-and-place process that creates a vacuum through an empty printing nozzle that picks up electronic components and plays them on substrate surfaces in a programmable way.